Yes, I know that is more than 2 words, but you get the gist. Let’s get to the point of what this all boils down to: Structured Markup. To all of my non-technical readers out there, DON’T LEAVE. Hear me out, okay? While structured markup is not the sexiest of terms in digital marketing today, it is one of the most important things you can learn about as we progress to the next level of search engine marketing sophistication. To get to the next level with your SEO efforts, your SEO foundation has to be top notch and up to date. That’s a given and I know you’ve “been there, done that.” So after you’ve checked off all of the best practices important for your industry, it’s time to revisit your structured markup strategy. Structured data tells Google what our site is about. The prevalence of screenless devices in our world today is growing at a lightning fast pace due to: the Internet of Things, wearables, personal assistants, and home “smart speakers” (like Google Home and Amazon’s Echo). We still don’t have a lot of concrete information about what businesses are going to come out on top. However, we have to make it easier than ever for Google to understand in a micro-second what our content is about. As a side note, the idea of structured markup isn’t new. SEOs have been touting for years now about the importance of marking up your content because of rich snippets and rich data that are displayed in the SERPS. We need to do everything we can these days in order to get clicks, right? We’ll get to that in just a moment. Did you know that 15% of Google searches done by users each day on Google are brand new? And that Google processes over 5.5 billion searches per day? According to one of my fave SEO experts Eric Enge, the idea that Google has to quickly and accurately serve up quality results for approximately 825,000,000 new searches a day underscores the power of machine learning capabilities, which introduces us to Google’s RankBrain. (And yes I definitely just googled 15% of 5.5 billion thank you). RankBrain is confirmed and widely known to be one of the top 3 ranking factors. It is Google’s AI system that instantaneously sorts and ranks web results. Adjustments and assessments are baked into the algorithm and no longer have to be “pushed out” (like was done in the past). In order for us to rank for the queries of tomorrow and next year, we need to make it easy for RankBrain to understand, display, and rank our content. Structured data is how much of that will happen inherently. 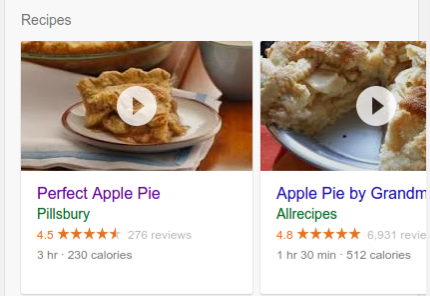 WHAT: What is structured data? Do you think you might be the one business where structured data doesn’t apply? Think again. Search Engine Land: this article details structured markup opportunities by the type of site you have. Genius! This code gets added to individual pages or posts through your CMS or source code. While this is not an item that upon doing will skyrocket you to success overnight, it is one that you have to add to your “near future” SEO checklist if your website is dependent on SEO and traffic and staying relevant in the future (hint: that’s all of us). HOW: How do we get it on our site? SEO is a critical piece of your website marketing plan. If you haven’t had an audit done in some time, this will be an important part of assessing opportunities. What are your experiences with structured data? Share below!